Are Hindus in Bangladesh quietly giving up on their country? Has the deep brotherhood forged by a shared language, culture and history caved in? Is the country's biggest minority group being forced to migrate in large numbers due to persecution? Though no one can deny that the Hindu population of Bangladesh has been slowly declining over the years since it got independence from Pakistan, questions of how much it has declined and why it has happened generates heated debate among both the communities, Muslims and Hindus. 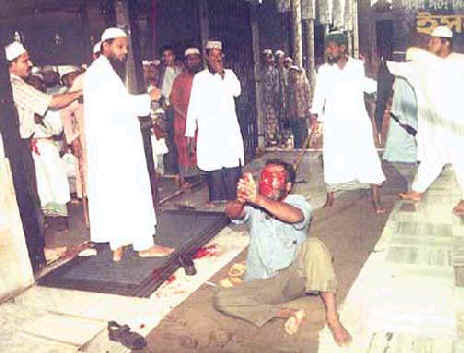 According to the census website of Bangladesh, in 2001, Hindus were 9.6 per cent of the population. Most blogs and websites devoted to the status of the Hindu minority in Bangladesh contrast this with the 28 per cent that once existed there. But they don't take into account the fact that this was the pre-Partition figure, calculated during the 1941 census. Soon after Partition in 1947, millions of Hindus fled to India. In the census after the Partition exodus, in 1951, the Hindu population had already fallen to 22 per cent and this again fell to 18.5 per cent by the 1961 census. "During the Bangladesh Liberation War of 1971, Hindus in particular bore the brunt of the Pakistan army's onslaught, leading to more migration,'' a Bangladesh government official told TOI-Crest . "Though many returned after the formation of Bangladesh, the 1974 census showed that the population had fallen to 13.5 per cent, mostly because of steady emigration to Burma and India. Obviously, since Bangladeshi independence, the Hindu population has not fallen as much as is being claimed. Bangladeshis cannot be held responsible for what happened even before they became an independent country." Rabindranath Trivedi, president of the Human Rights Congress for Bangladesh Minorities (HRCBM), has a different take altogether. According to Trivedi, the census was deliberately undercounting Hindus in Bangladesh, who, by his estimate, constitute about 15 per cent of the population even today. "The government does this on purpose to deflect the charge of large scale Hindu migration due to state oppression,'' he said. "With a low percentage to start off with, there can be no declining population due to migration. In reality, there is continuous migration of Hindus from Bangladesh because of torture and humiliation." But there are other, equally compelling, reasons for the demographic shift. India's long and porous borders with Bangladesh, old family ties and ethnic similarity coupled with better economic opportunities have resulted in continuous illegal migration of poor Hindus and — not to forget — a considerable number of Muslims. In fact, the home ministry concedes its inability to fix a number to the volume of Bangladeshi Muslim immigrants coming into India. "India being economically better off, it is the natural destination for the poor, both Hindus and Muslims,'' explained a Bangladeshi official. "A lot of migration is on economic grounds rather than due to any persecution." Government officials and civil society leaders further argue that violence against religious minorities comes with its share of political and economic undertones rather than purely religious ones. "It suits those who have fled to India to make the situation seem worse for Hindus in Bangladesh than what it is. This helps justify their fleeing and seeking refuge in India," one of them said. Bimal Pramanik, director of the Centre for Research in Indo-Bangladesh Relations, Kolkata, said, "Bengalis fought communal forces to fight for independence as a Bengali nation. There was only one identity, that of a Bengali. But after the assassination of Sheikh Mujibur Rehman and the army takeover, total Islamisation started and the Hindus felt betrayed." After the Awami League's victory in 2008, Sheikh Hasina came to power and initiated steps to secure the rights of minorities. International bodies have since then been more positive about Bangladesh's efforts to protect minorities. This even as one of the most vexatious of issues, land grabbing, continues unaddressed. Professor Abul Barkat of Dhaka University's Department of Economics, in his survey on the status of Hindus since independence, found that the Vested Property Act was the single largest cause of migration of Hindus from Bangladesh. The law, which allowed the government to possess property abandoned by those who fled during Partition, soon metamorphosed into something abused by both citizens and the state. The study found that 2.01 million acres, comprising 45 per cent of the land owned by Hindus, was lost due to this Act. Though there were attempts to amend the law, little has changed. Sustained campaigning on the issue led to the Awami League government passing the Vested Property Return Act 2001. But this law to return appropriated land is caught in bureaucratic and legal tangles. "When it comes to land, there is no secularism. All parties have been involved in land grabbing and no one is keen on implementing this law," Hossain said. Faced with charges of persecuting minorities, the pomp and peaceful conduct of Hindu festivals like Durga Puja and Saraswati puja are often held up by the government as examples of religious tolerance and proof of the rule of law. But Trivedi has a counter view. "Muslims, too, participate in our festivals,'' he said. "But that is because it is part of their culture as Bengalis. Hence, even if the last Hindu leaves this country, Muslims will continue to celebrate the festivals." Many Hindus see the Pujas more as a sort of dole and appeasement of minorities, seeing no hope for real improvement in their status. "The persecution will continue till the last Hindu is driven out. Hindus will become objects in a museum, a people who once inhabited this land," Trivedi said. Pramanik agrees. "Despite all efforts of the Awami League to undo the damage done to Bangladeshi society from decades of Islamisation, it just might be a case of too little too late,'' he said. Last edited by sunnykode; February 24th, 2011 at 11:10 AM. Declining number of minorities in Muslim countries would hardly be surprising. Then they will claim that the minorities have found the "true" religion. In 1941 hindus were 28 percent of the region that was to later constitute bangladesh . According to the 2001 census , they were 9.2 percent . According to latest reports , they are 7 percent in 2011. No.. it won't ever become 0%.. they will keep some in the zoos.. er.. reservations maybe..
BTW what are the important Hindu landmarks in Bangladesh?? any info. It could actually increase a bit if after continuouis migration to India leads to a formation of 'Greater Bengla'. On Hindu landmark is Dhakeswari Temple after which the city of Dhaka is named. Last edited by AmthaLal; February 14th, 2011 at 08:28 AM. Reason: Sorry. The image is too bad to look at. Thats some news.. I mean who cares if many stupid Hindus decided to still stay back in Pakistan or Bangladesh and not come back to India? nothing about coming back Cha.. they are not immigrants, they are the original inhabitants of those regions. congress welcome illegal muslim bangladeshis in india..but they would never invite the opressed hindus in BD to india...they dont want indian muslims to get offended...plus illegal bangladeshi muslims make up their vote bank afterall..
one persons name i have already given--vimal patak. the other is a hindu professor --his name starts with M......i forgot it . but the site i copied them from had given their names . Then there is this blogger http://dinajpur-puja.blogspot.com/ who has all the pics for the pujas and pandals at his place in bangladesh. His only complain is its not as big as kolkattas'.